A slimmer waist and bulkier biceps. Feelings of vitality, flexibility, and just being able to climb the stairs without getting winded. Who doesn’t desire the physical effects of exercise? Who would refuse a stronger core as well as a stronger heart? We like the way our clothes fit when we’ve been working out, rather than how they cling when we’ve been eating cookies. Exercise surely boosts self confidence and improves self image – But there’s even more to it than that! For centuries, survival depended upon getting – and NOT being – food. Back when outrunning-or outsmarting-a tiger meant the difference between life and death, quick thinking and efficient movement were intertwined to keep us alive. It follows that exercise and the brain were closely linked to allow our survival. Being synergistically smart and strong allowed humans in more primitive settings to stay alive long enough to bear and raise children. It’s easy to get a bit lazy when we can drive to a restaurant for dinner, and simply stay away from the jungle to avoid preying tigers. But living in a society in which exercise and sharp thinking aren’t necessary may have its disadvantages. Have Safeway and Toyota made mental prowess and physical fitness obsolete? No way. The link between exercise and brain health is alive and well. It’s not as crucial to everyday survival, but that link is still hard-wired into human beings, and integral for our health and well-being. Numerous studies abound, proving the perks of exercise, but it goes well beyond miraculous physical gain, like preventing heart attacks and diabetes. Exercise fights depression, dementia, insomnia, and anxiety. Read on to find out how exercise directly affects the brain. Neurogenesis – Neuro means “nerve” and genesis means “formation.” Although the vast majority of brain cells are signed, sealed, and delivered with the newborn, never to reproduce after birth, one thing you can do to build your brain is exercise! When muscles contract during a hard workout, they secrete BDNF, a protein that helps brain cells reproduce, thrive and grow in the hippocampus, the part of the brain related to learning and memory. Studies have linked physical fitness with brain development in children, and a quick sprint with sharper vocabulary retention in adults. Wise Old Age-Keeping the brain healthy and hearty for a lifetime means a stronger defense against the functional loss that can happen as we get older. Age and Alzheimer’s cause shrinking and degeneration of the brain. We have no cure, so keeping the brain in tip-top condition is one of our best defenses. More neurons, more connections, and more natural ability to make the proteins that keep the brain active are great ways to be proactive. Exercise not only keeps the body full of life as we age, but it can line the path to our golden years and keep them flourishing with great memories and lively interactions. Turn on the pleasure centers of the brain – There are parts of the brain whose job it is to drive us back to substances and situations that have given us pleasure before. “Seek pleasure” is a chemical reality in the brain. Returning to the places where berries grew or rabbits lived, offered primitive man tasty and pleasurable treats, keeping him alive. Being groomed feels good-and at one time was instrumental in keeping humans healthier by removing ticks and fleas. Lots of things that feel good, are good for our survival, including exercise! Pleasure is so important for a thriving human that we have a neurotransmitter (protein that carries messages for the brain) especially designated for the purpose. It’s called dopamine, and exercise is one of the many ways to release it into the system, creating feelings of pleasure and reward. On the darker side, nobody’s perfect, even the brain. Alcohol, cigarettes, and nearly all drugs of abuse stimulate dopamine release, which launches addicts mercilessly back in the direction of their addiction. The good news is that by exercising regularly, addicts can actually help themselves kick bad habits. The dopamine they seek through their addiction to drugs, cigarettes or alcohol, can be activated instead by exercise! And dopamine isn’t the only neurotransmitter shared by exercise and addictive habits. Smoking a cigarette calms peoples’ nerves by releasing a neurotransmitter called norepinephrine, which mitigates stress. Guess what else spurs on norepinephrine: Exercise! By the way, alcohol interrupts our circadian rhythms (and messes with our sleep.) Exercise hits the “reset button,” restoring the natural rhythm of solid sleep and alert wakefulness without drugs. Good Old Endorphins – The word “endorphin” is a hybrid: “En” is taken from “endogenous,” which means “made inside the body.” “Orphin” is taken from “morphine.” Endorphins are our homemade pain killers and natural high. They’re well-known for giving us those peaceful feelings of happiness and well-being. You guessed it: Exercise releases endorphins. 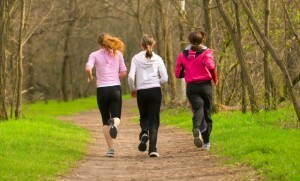 In a healthy individual, the endorphins triggered by exercise provide a wonderful mood boost and a great outlook. In a person suffering from depression, exercise can be as effective as prescription anti-depressants, or can be used synergistically with appropriately prescribed pharmaceuticals. Creativity and Productivity – Studies show that exercise has an immediate effect on creativity as well as productivity. Large companies that build on-site gyms are listening to the research. According to a study published in the British Journal of Sports Medicine, creativity rises for the two hours following a workout. Studies show workers are more effective, efficient, and satisfied when they work out regularly. Moderate workouts alleviate anxiety. Instinctually, it makes sense that exercise can relieve stress, just by the physical discharge of pent up energy and frustration. Add in the science of increased blood flow, endorphins, dopamine and norepinephrine and now you’ve got a recipe that can’t be beat for letting go of stress. The learning centers of the brain are literally shut off in times of stress, while the survival mechanisms take over. Taking stress offline puts learning back online. And exercise is a great way to make the switch. I hadn’t run much in the past decade when a friend asked me to do a 10k with her this spring. She gave me plenty of notice, and we googled an 8-week beginning runners’ training schedule. Morning after morning, I had little to no desire to get out of bed, lace up my new yellow running shoes and take West Cliff one grudging step at a time. However, my commitment to a friend-and the knowledge of how race day would feel if I continued to eat pancakes instead of stepping up my exercise routine-was enough incentive to get me out there, even on the days when at best I jogged, and at least I walked a couple of miles. It doesn’t matter if it’s your pilates instructor expecting you at class, or your 10- year old counting on you for a game of beach volleyball. Good excuses are harder to come by when you’re saying them out loud to someone who’s counting on you, so make a commitment! Eighteen years ago, when I first stared in this career, I was happy to greet patients who came in around New Year’s excited about their new exercise routines. All of them looked beautiful-faces lit up by happy hearts and improved blood flow. But only a few were enjoying exercise’s benefits by February. I soon learned that a good way to encourage people to stick with it is to encourage them not to overdo it. Zealous exercise six or seven days a week is just too much to sustain for most amateur athletes. As I have seen over the years, plodding along in a humble routine two to five days a week seems to be a key. It’s like getting adjusted regularly instead of waiting until you get hurt. To my patients who are thriving from years of light to moderate exercise … Congratulations and thanks for the inspiration! Jumping jacks aren’t your cup of tea? Running may be hard on your joints. Maybe your boyfriend kite surfs, but you can’t even seem to get the rope untangled. Around Santa Cruz, it’s never a must to do an exercise that’s boring drudgery or intimidatingly technical. If you’d like to try mountain biking but you’re afraid of rocky slopes, there are plenty of fire roads at Nisene Marks or Wilder State Park, not to mention endless indoor biking at the Bike Dojo year round. Simkins Center on Seventeenth Avenue is open to swimmers of all skill levels and ages. We have miles of beach for walking, dozens of yoga, qi gong, and tai chi classes. There’s even a climbing gym off of Seabright where you can work out, learn to belay, and boulder seven days a week. Ideal Bar and Grill sponsors a free outdoor salsa extravaganza from 3-7 every Sunday (weather dependent)! If you’re not afraid of heights-or even if you are and want to conquer that fear, Santa Cruz Aerial Arts is an incredible and exciting workout. So think up your ideal exercise, google it or ask around, and chances are you’ll find it or something similar-and lots of fun people to do it with you!